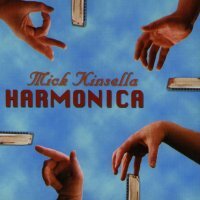 Mick Kinsella, one of Ireland's best kept musical secrets, further enhances his reputation as one of the finest harmonica players east of the Atlantic on both diatonic and chromatic with the release of this, his first solo album. An unashamed advocate of the overblow school, Mick puts his diatonic harps through their paces, demonstrating the potential of this approach to playing in both the traditional and 'world music' styles represented here. With excellent control and a horn-like tone to die for, Mick breaks new ground by taking the Richter-tuned diatonic beyond the limitations that have previously restricted its potential for expression and interpretation by more traditional players. A very fine chromatic player, Mick displays his skill with the standard tuned chromatic on the haunting 'Canyon Moonrise', his full tone enhanced by the rich string backing. Rosaleen's Children/ The Spanncomp Jig features Mick's use of chromatic modified to allow for ornamentations more consistent with those found in traditional styles of Irish music, an approach learned from legendary Irish player Eddy Clarke. While the influence of traditional Irish music is evident throughout the album, Mick draws on many sources both for repertoire and inspiration. He pays homage to English folk/blues diatonic player Rory McCloud by doing a cover of 'Take Me Home', and 'Marcelle and Marcel' by the French master-blaster Jean-Jacque Milteau. Besides demonstrating his own formidable skills as a composer, he also draws on his blues roots on 'See the Blues'. In the album's liner notes it's written: "He is a wonderful musician and more importantly an equally wonderful person. He deserves to be heard. I now that this gem will bring much joy to all who listen!" I couldn't put it better myself.